Please remember: the OWA Annual Business Meeting is Tuesday, October 20th, 2009sat 6:30 PM at the Offices of Barcelon + Jang, 315 Bay Street, 3 Floor, San Francisco, CA 94133. 1-- Voting on updated Articles of Incorporation and Bylaws. The Steering Committee is in the process of drafting updated its founding documents, the Articles of Incorporation and Bylaws, to bring them in line with current law. 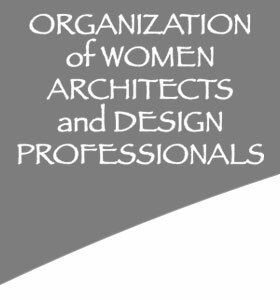 OWA's current Articles and Bylaws are more than 30 years old and much has changed legally since they were originally drafted. OWA's system of non-hierarchical self-governance will not be changing, however. 2-- Nominating and electing new Steering Committee members. The Steering Committee has five (5) members. At the end of 2009, 3 of the current members will end their terms, and their replacements will be elected at the General Meeting on October 20. Nominations to the Steering Committee can be made ahead of time by writing or emailing the Steering Committee. Nominations can also be made at the General Meeting on October 20. 3-- Increase in spending authorization. The Steering Committee will propose increasing the outdated OWA spending limits of $75. This would allow the Steering Committee to make fiscal decisions (such as producing the OWA reception during the AIA Convention in April) without needing to poll the membership for permission. The proposed new maximum expenditure is $5,000.00; any amount over that would require a vote of the membership. The Steering Committee will also propose that two signatures be required for any check over $500.00. 4-- Other matters to be considered and voted on. More information will be sent to you in coming weeks about other matters to be considered and voted on at the October 20 General Meeting. Please watch your email and/or US Postal Service mailbox for written notice from the OWA which will contain the draft Articles and Bylaws and more information about the October 20th annual general meeting and other matters to be considered. There will also be information on how to vote if you are not able to attend the meeting, because your vote is important. For the October 20 vote to be valid, at least one third (1/3) of our current, dues-paid-up members must attend the October 20 meeting, either in person, or by voting through the mail, or by given written authority to another member to vote on your behalf. To approve matters proposed, the consent of more than 50% voting is required. Dues not paid? You will not be able to vote. Please contact Leslie Allen (leslie@owa-usa.org) to address your questions and concerns about the article or bylaw changes, etc., PRIOR to the General Meeting on October 20th. Also, you may add your comments here. Recently, I had the pleasure of taking an architectural walking tour while visiting Seattle. The tour is hosted by the Seattle Architectural Foundation and was led by a Foundation member, Roberta Miner and local architect, Aaron Swain. The tour I took covered roughly four blocks. Roberta and Aaron chose an interesting theme for the Architecture 101 tour. The tour was based on the history of glass in structures and how glass works in buildings. The tour covered over ten buildings that were built in Seattle as early as 1908 up to 2006. The tour discussed how window glass and its usage has changed over time due to the user’s needs. The range of buildings and architecture chosen was very dramatic from the Italianate design of the Fairmont Olympic Hotel (circa 1924) to the 1964 post –modern IBM building designed by Seattle-born architect Minora Yamasaki. The tour took in several of Seattle’s highlighted buildings from the civic architecture of Benaroya Concert Hall designed by LMN Architects 1998 to the Seattle Art Museum (SAM) by Robert Venturi and continued on to eco-textured Four Seasons Hotel built in 2006. This tour did not include interior visits to these buildings but did stop into Benaroya Concert Hall where one could view the amazing ‘Chrystal Cascade’ Chandeliers by Dale Chihuly. The Foundation offers several other tours throughout the city. If you are interested in taking any of these while visiting Seattle, please contact the Seattle Architectural foundation at www.seattlearchitecture.org. Ms. Riley’s focus on the project has been exterior skin, including architectural concrete, plaster, curtain wall and windows, roof etc. She has also involved in the LEED certification process. If there is interest in other aspects of planning, perhaps she can have others join us. Please state your interest when you sign up. Please sign-up by Sept. 25 by contacting Joanne Chow Winship53-7550 or joanne.winship@sfgov.org. Upon sign-up, specific meeting directions will be provided if you supply email address. The tour is limited to 30 people. Each group of ten requires one safety trained person as a chaperone. Each person is requested to wear sturdy shoes and will be supplied with safety vests, glasses, and hard hats. Laguna Honda Hospital is located at the 375 Laguna Honda Boulevard, San Francisco and across from the Forest Hills Muni station. Rosemary Muller makes a point. Thanks to the enthusiasm of OWA retreat attendees and the thoughtful donation of several scholarships from OWA and retreat attendees to assist the unemployed and recent graduates, the retreat enjoyed a full house. The program this year was to learn more about our own varied interests and experiences and to give everyone more time to converse with the group than the usual gripping but limited 3 minutes on Friday night. 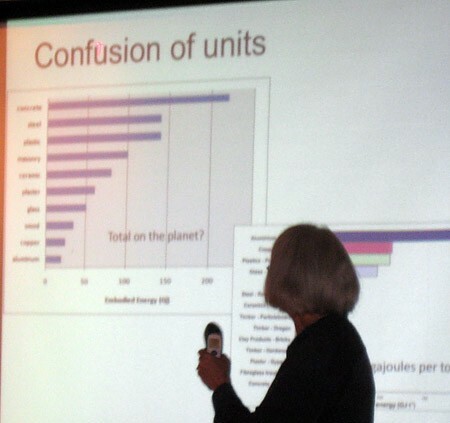 The presentations turned out to be as engaging and unique as we had hoped. Those with a professional focus included the design of a green home (Judith Wasserman), a discussion on “how big is a building”, about programming for large institutions for greater efficiency (Christie Coffin), a description of planning for equestrian facilities for the National Parks Service (Andrea Lucas & Carolyne Orazi), interfacing with the community over a major Kaiser medical facility development in Oakland (Cameron White), the energy pros and cons or repair versus replacement of windows in a historic home (Rosemary Muller) and new approaches to contracting for construction of university buildings (Alicia Rosenthal). Jamie Brown serenades the group. Several members bought paintings, sculpture and photography (Judy Rowe, Leslie Allen, Linda Corbett, Stacy Webb, Julia Bergren and Betty Woo). Gisela Leuchel and Kirsten Kruse showed their beautiful knitting which offers a respite from professional tasks, and Ann Wright brought a stunning quilt. Several members talked about where they are in their professional life and shared their thinking of future interests, priorities and opportunities. And Jamie Brown, guitar player from early youth, sang two moving songs including one that she wrote herself. The art project this year was beading, lead by Leslie Allen, Mary Anne Perkowski and Hana Mori. The results were quote wonderful: from elegant and witty necklaces to fine bead weaving, a specialty of Hana’s. The group enjoyed two yoga sessions lead by Pam Field with humor and encouragement. The musical entertainment was one of the best bands to liven Saturday night: Annie Byrd and the Tee Fee Swamp Boogie Band, playing Cajun and Zydeco music and leading the group in the two step, crooked waltz and a Cajun variation on the electric slide which had the whole room on its feet. Many, many thanks to the retreat committee: Judith Wasserman, Rosemary Muller, Mary Anne Perkowski, Leslie Allen, Hana Mori and Heather Sprague. We look forward to seeing you in Sonoma on September 24 – 26, 2010! 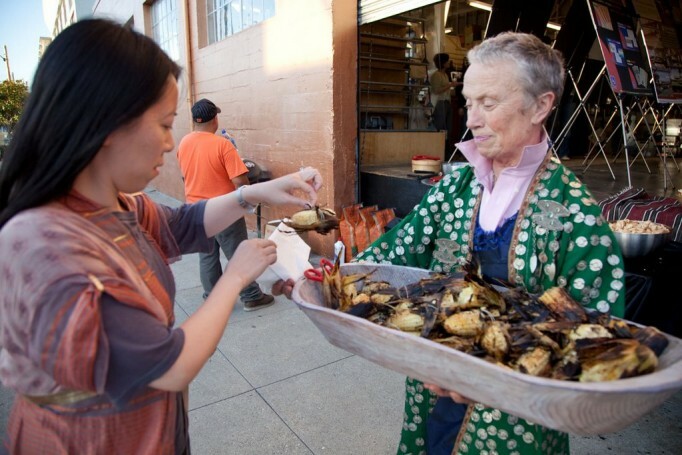 Topher Delaney serves up her fine local corn at the reception. The exhibition is being held until September 30, 2009 at ARCH Store, located at 99 Missouri Street, San Francisco, CA, open weekdays from 9 AM-6PM and Saturday s, from 12 PM-5PM. Please stop by and view the work of your fellow OWA members, their work is presented on boards and in a PowerPoint presentation. If you need directions, call the store at 415.433.2724. 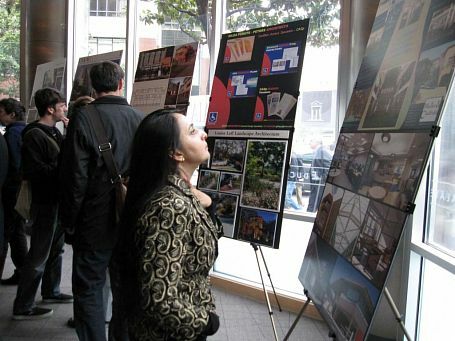 The reception for the exhibition was well-attended by many members of OWA and several members of the Bay Area architectural community. Susie Coliver and her staff supplied delicious food that was nicely complemented by Topher Delaney’s fresh roasted locally-grown urban corn. Susie Coliver, Topher Delaney, and Darlene Jang all worked on hard on creating another wonderful venue for OWA members to display their creative talents and showcase the environmentally-friendly work they’ve been doing in the Bay Area and around the world. Exhibition pictures will be posted in the next newsletter.